Having a modern true Cloud ERP system like Microsoft Dynamics 365 Business Central can bring huge benefits to your business. 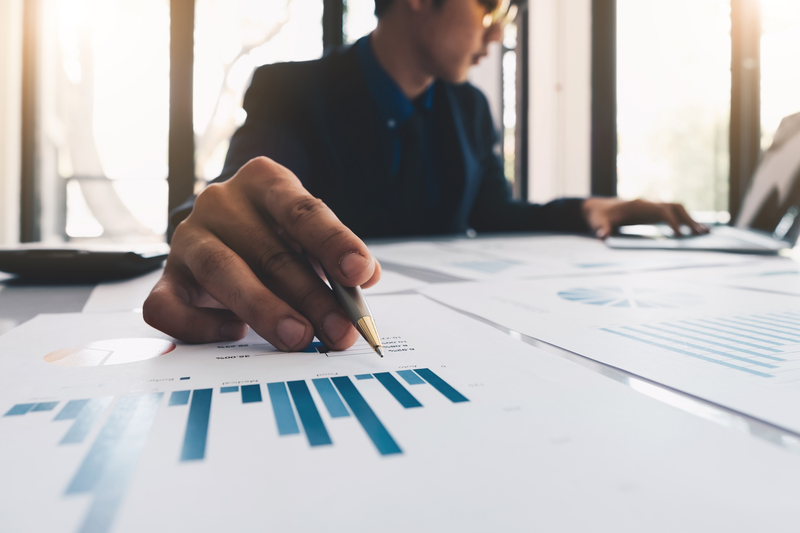 For starters, think highly improved efficiency that comes from streamlining your key operations - but without the large upfront costs associated with ERP systems. FIND OUT WHY INVESTING IN ERP IS A MUST-HAVE PRACTICALITY FOR PROFIT-SEEKING SMEs! But perhaps you've unique business requirements that aren’t covered by Business Central out-of-the-box. For on-premise ERP systems, you'd normally have to contact your ERP vendor for help. From there, it's a complicated journey of finding the right third-party vendors, integrating add-ons and so forth. That means down-time. Productivity losses. Staff complaints. The good news is that true Cloud ERP systems from big brands like Microsoft makes it much easier for you to bridge the down-time gap. These tech giants have the R&D and sheer global reach to ensure you always access to add-on extensions and integrations in an online 'marketplace' like Microsoft AppSource. Just like how you might install an app on your phone. Not already familiar with Microsoft AppSource? To begin with, you might think of it as an app store for businesses. Specifically, it's a web-based marketplace for add-ins (which Microsoft also refers to as apps, or extensions). 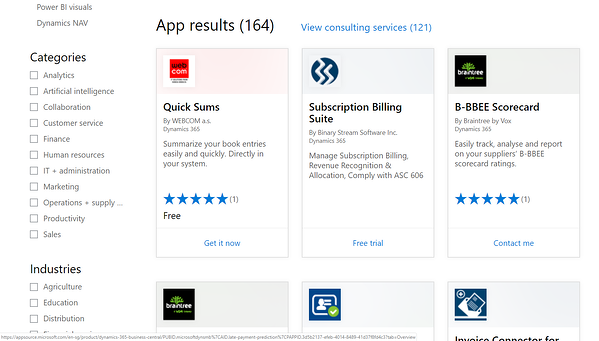 These add-ins work with Microsoft products including Business Central and Office 365, with over 150 of them unique to Business Central alone. 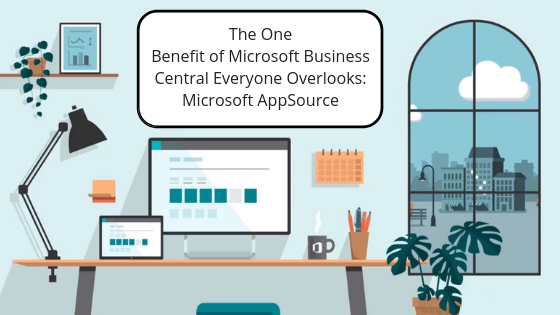 AppSource is the home of add-on tools you can use to get more done with Business Central. It’s the go-to place if you’re looking for solutions that fulfil industry-specific requirements (like loan processing for financial institutions), or offer advanced functionality (think higher-end reporting tools like Jet Reports). Like their mobile counterparts, these add-ins will integrate seamlessly with Business Central out of the box. So, you can now expand your system’s capabilities rapidly, as and when your business needs it. And unlike ERP customisations, they’ll be ported over automatically with each upgrade. That way, you get to save on the time taken as well as the costs of having additional functionality re-implemented from scratch. The installation process is fairly clear-cut. If you’re looking for a late payments prediction tool for example, simply download it from AppSource here and follow the set-up process. Now you're on the path to managing your receivables better. Here's how you can install apps from AppSource to add more features to your ERP. And if you prefer to shop around to see what fits you best, you can also download most apps on a free trial basis. Thus far, we’ve considered the power of add-ins in a rather abstract fashion. Let’s have a look at an extension that could help you manage the complexities of tax returns. For Singapore businesses that need GST localisation for Business Central, AFON's GST Extension lets you generate detailed GST documentation, including input and output tax reports. It’ll also automatically populate your GST returns (GST Form 5) for you. AFON GST Reports is fully integrated with Business Central’s sales and purchasing functions, so you won’t have to manually account for GST. The figures are compiled from a predefined GST entries table, spanning sales invoices, purchase receipts, and the general ledger. Now you’ll have the peace of mind that your returns are accurate and based on a single version of the truth. 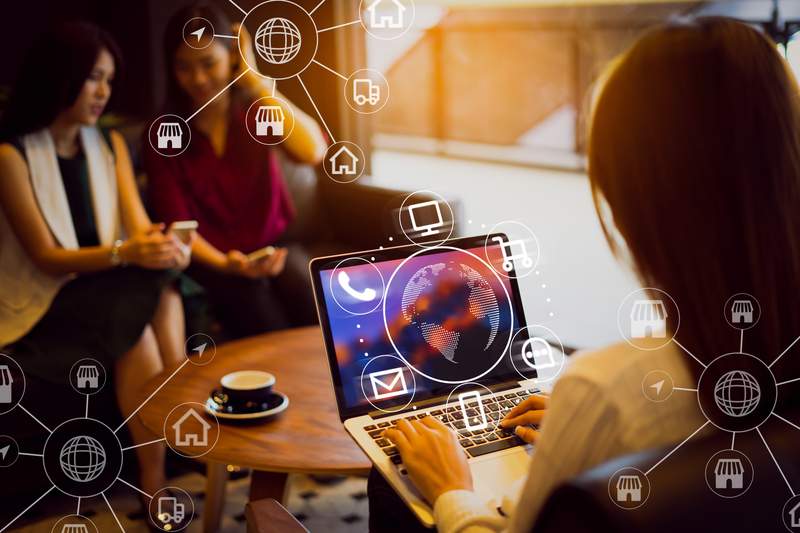 In this article, we've shown you how you can easily bring the power of ERP to other aspects of your business, by extending its capabilities through plug-and-play add-ins from Microsoft AppSource. But AppSource is just one of Business Central’s many benefits. If you’d like to find out how it can help you boost your revenue, maximise your business’s performance, and more, drop us a note here, and a consultant will be in touch shortly.